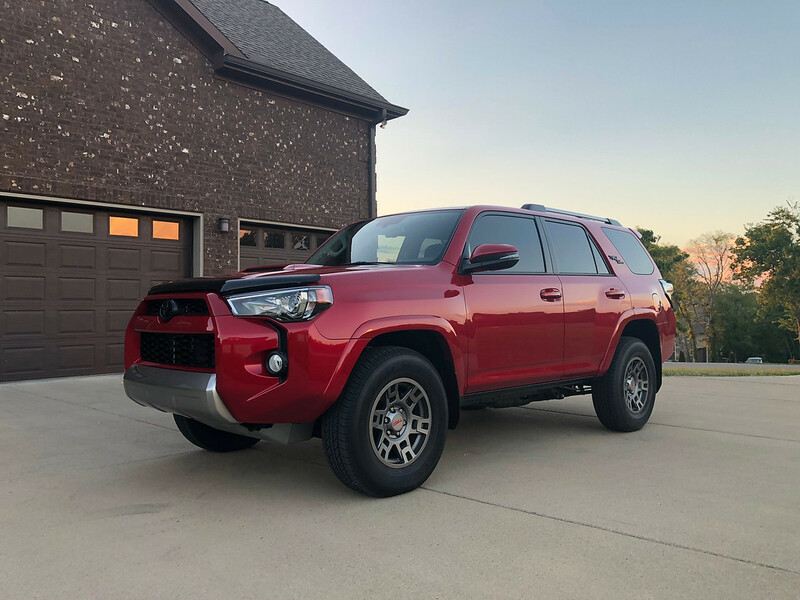 Quick Links: Led headlights lows highs drls and fogs Gas Cap with lock Changing Differential and Transfer Oil on 5th Generation Bought a 2018 TRD Off Road Premium and I’m hooked on mods!! Wheel Spacers Door edge guards and body side moldings? Discussion in '5th Gen 4Runners (2010+)' started by Redondo_dom, Aug 23, 2018. Black emblems, KMC wheels, plasti dipped roof rails. Where's all my Red Runners at? Strandskov, arnette64, rockybird and 3 others like this. Ahadk, Strandskov, rockybird and 4 others like this. WallyT4R, Strandskov, rockybird and 2 others like this. WallyT4R, Strandskov, rockybird and 3 others like this. Bought our 2018 TRD ORP a week ago this past Saturday. Since then I've had the windows tinted, removed the cheesy plastic running boards, applied the black-out emblem covers, installed the AVS bug shield, ordered the black rear bumper valence and have a couple cans of satin-black Krylon Fusion waiting for the front valence. Since I plan to order an SSO Slimline front bumper, I couldn't justify the expense of doing the TRD Pro front valence. I gave Plasti-Dip a spin first but I messed it up while waiting for it to dry. I figured I liked the way it looked but wanted something a little more durable for the short-term, so... Krylon Fusion it will be. I've got some stuff left over from past rigs that I plan to install as soon as various parts arrive: Baja Designs Squadron Sport white LEDs for the fog positions, some Squadron Sport amber LEDs and a 30" double-row bar behind the grill, an ICOM 2m HAM radio, and some other stuff. First big mods will be a suspension lift (not sure which yet) and some slightly larger all-terrain tires. Anyway, glad to be here and glad to be back in an off-road capable Toyota. I had a 2010 FJ Trail Teams that I loved and very briefly a 2016 TRD Pro Tundra - which I hated. SR5 Limited, WallyT4R, Strandskov and 3 others like this. Strandskov and GoXplore like this. Welcome from down the road in Shelbyville Tn. We're really not that far from each other. I'm in Thompson's Station. I list "Nashville" since everyone pretty much knows where that is. Strandskov, brownbear and eaglescout like this. Strandskov and brownbear like this. I'm waiting on my Shrockworks rock sliders, C4 Fab Low Profile winch bumper and LFD Offroad skid plate ( all should be here within 3 more weeks) and then I will be ready to go on some trails! Maybe you could tell me where some places to go in our area. WallyT4R, Strandskov and GoXplore like this. ruiz4251 "but it was funny huh?" Hi George, what part of Texas are you in? Could you post a couple more pics of the bug deflector? Like closer up from the front and side? Is there a raised sticker/label on it? brownbear and Strandskov like this. brownbear, eaglescout, GoXplore and 4 others like this. love the high clearance. gonna get thos next month I think. Yeah I can take a few pics. There was a raised label; I peeled it off and threw it away. No need for pics (unless you wanna post for the record)- I just went and bought the AVS an hour ago. Great fit. I peeled the sticker off. What did you use to clean off the sticker residue? LostHusker and brownbear like this. Thanks. I just used some WD40 on a soft cloth to wipe away what little residue there was. LostHusker and 4runningMan like this. arnette64, brownbear, Redondo_dom [OP] and 1 other person like this. Current view, lift gets installed next weekend. brownbear, Redondo_dom [OP], BassAckwards and 2 others like this. Redondo_dom [OP], BassAckwards, LostHusker and 3 others like this. Need to take a picture when it's clean. Redondo_dom [OP], BassAckwards and brownbear like this. Redondo_dom [OP], JET4, brownbear and 1 other person like this.